The Amazing Spider-Man 2 (12A) is the long-awaited sequel to director Marc Webb and Andrew Garfield’s first Spider-Man installment in 2012. What’s It About? Continuing with his more faithful adaptations of the Marvel comics, Webb’s The Amazing Spider-Man 2 picks up with Peter Parker (Garfield) and Gwen Stacy (Emma Stone) graduating high school, Peter’s childhood friend Harry Osborn (Dane DeHann) returning to New York after years at boarding school, and an accident at Oscorp turning Spider-Man super-fan Max (Jamie Foxx), into glory-seeking villain Electro. Verdict? The film opens with a flashback to the death of Peter Parker’s parents when Peter was a child, which serves as a great reminder of the mystery that surrounds their disappearance and a more detailed insight into their final moments, and sets up this story to develop throughout the film. Flash-forward to modern day and Peter is doing what he does best: swinging through New York City solving crime and saving pedestrians. The use of 3D gives the film a very slick feel, and the breathtaking visuals really come to life as you swing around the city with Spider-man. The 3D effects are strong throughout the film, but it’s during these scenes in particular that you will truly appreciate and marvel at the special effects. The narrative picks up where the first film left of. Peter’s girlfriend Gwen is still the only person who knows Spider-Man’s true identity and while she struggles to cope with her boyfriend’s double life, Peter also fails to find the balance between his personal life and his vigilante alter-ego. Garfield continues to trump Tobey Maguire’s portrayal of the character as he gives him the wit, sarcasm and likability that is found in the original comics. He brings believability and relatability to an otherwise surreal situation and efforts to maintain his relationship with Gwen bring an element of normality to Peter Parker’s life. 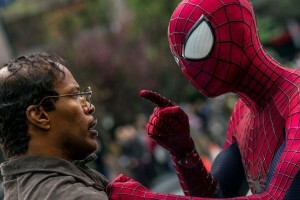 Although Garfield steals the show as the leading man – and rightly so – all of the characters are well-rounded and when Spider-Man saves unassuming ‘nobody’ Max Dillon from death in a busy New York street, Max becomes obsessed with Spider-Man and begins to believe that they’re actually best friends. Ignored by many and mocked at work, it’s hard not to feel sympathy for Max. When he has an accident at Oscorp and turns into villain Electro, it’s all the more upsetting because you know he isn’t a villain at heart and his transformation is just as confusing and unsettling for him as it is for the viewer. However, Electro isn’t the only villain in the sequel and the plot is full of surprise twists and turns with action-packed fight sequences as well as an emotionally engaging subplot surrounding Peter and his personal relationships with both Gwen and his Aunt May. Final Words: Garfield and Webb continue to be a winning team when it comes to Spider-Man as they create strong characters and an enjoyable narrative, and combine these with stunning visual effects and 3D. The combination of action, emotion, and surprise twists together create a film that is so engrossing the two and a half hours fly by. The Amazing Spider-Man 2 is in UK cinemas from 16 April 2014.